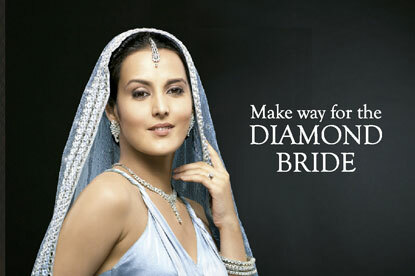 LONDON - How JWT Mumbai overcame conservatism to promote diamonds as the jewellery of choice for the Indian bride. imagined a new kind of bride. For our client, DTC, weddings were the single largest purchase occasion. then created it. A bride who is more happy, than married. Free to be herself and brimming with joy. Diamond brides are happy brides. Gold brides, just dutiful ones. context, personal choice takes a backseat and the traditional way holds sway. because it looked pretty but also because it evoked deep socio-cultural meaning. Connotes the transfer of wealth. It is gifted by parents as a form of 'stree dhan'- literally, woman's wealth. brief was to create a preference for diamonds vs gold. We could have taken the path of metal vs stone. preference for one kind of wedding vs another, one kind of bride vs another. Most wedding communication focuses on parents. It stands to reason because most weddings in India are financed and managed by parents. purchase of jewellery, the main decision maker and influencer is as much the bride as the mum herself. admit, required a fair degree of conviction. status, glamour but, could not take on the 'rightness' of gold. focus groups in 3 cities Mumbai, Delhi, Chennai, using techniques of category archaeology and semiotics. Analysing these projections revealed deeper motivations of purchase for both types of jewellery. There certainly was more to it than met the eye. gold was a glittering cover up of family and financial pressures. purchase of diamonds at weddings was a curious mix of style and a happy informality. This was a discovery with enormous implications that planning identified and focused on. choice, of the woman having an opinion and a right to have a say, of a modern, aspirational statement. diamonds will now tell her. Celebrate the happy bride, celebrate the diamond bride. contemporary weddings, so people could feel the difference between the old and new paradigms. creative idea was that the diamond is the stone for the bride with a spark. bedecked in gold jewellery is an iconic Indian image. three re-inforcing pillars working together. trend booklet on the Diamond Bride was sent out to subscribers of Femina and Hello magazines. In terms of market results, the wedding diamond jewellery growth of 30% exceeded the overall diamond jewelry growth of 20%. cultures. We learnt that planning is about translating old things into new meanings.